Breaking Bad is often championed more for its original and affective cinematography than its storytelling. But the the moving photography and script go hand-in-hand, form and content. Cinematography, in any visual narrative, at its most sophisticated extends itself beyond being aesthetically pleasing and provides insight into the story’s characters, narrative, and world. It’s maybe obvious to say out loud, but cinematography creates meaning. Let’s examine the Breaking Bad reflection shot above for a moment. Refelction in film and TV are always representative of the disconnect between who the character actually is, the thing being reflected, and who the character thought they were until they’re forced to face an ugly truth. The triple head reflection in the shot compounds the contemplation of identity, possibly suggesting a divided self, the conflicting personalities within Walter (family man, Jesse’s partner, and Heisenberg). 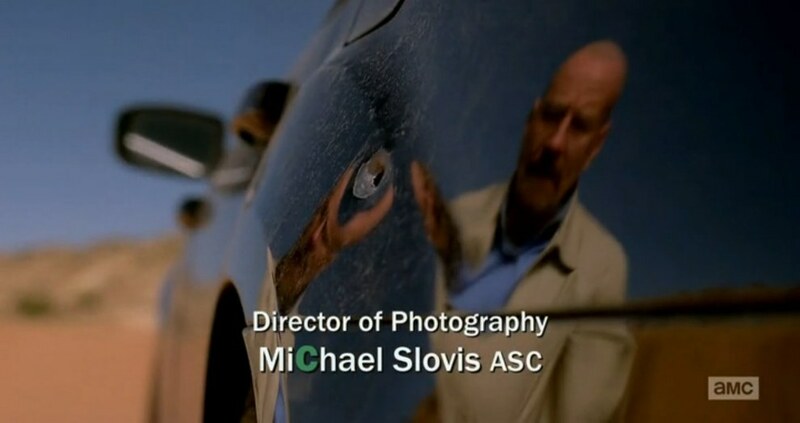 The most obvious symbol to read is of course the bullet aligned directly over the reflection of Walter’s head. Is this symbolism reinforcing the danger and tension of the scene or foreshadowing an violent end for our crystal meth Macbeth? The possible interpretations in this case are communicated through the form of cinematography, the unique aesthetic of film and television. When D.P. Michael Slovis framed the bullet hole he utilized the form, at least loosely, to maximize the potential for meaning making. So I ask again my mostly rhetorical question: does gameplay create meaning? The answer: not always, but it can. Gamplay is much more difficult to read or to interpret because of its mechanical nature. You can read any frame from Breaking Bad because of the nature of how human beings internalize visual symbols. Game mechanics and rules don’t easily lends themselves to be read as you are first inclined to solve and interact with them. Executing, interactivity, is the equivalent of perception in visual mediums. I’ve recently been playing the Ratchet and Clank reboot and was wondering about meaning making in regards to the platform combat of the game. I’ve really enjoyed how punchy and responsive the controls are and the play-feel of the game, but have u been deciphering meaning? Not really. I’m prompted to say that gameplay may be more inclined to evoke emotion than communicate complex themes. In other words, interactivity in games may be better at making you feel than making you intellectually engage with thematic concepts. That’s not a knock on the medium just an initial thought. While rarely accomplished, game rules can certainly create meaning. The resource management of The Long Dark for instance, could be thematically read as commentary on desperation, survival, and fear. Bioshock famously used the false illusion of choice in gameplay (Would you kindly, pick up that wrench?) to comment on predetermination, authority, and free will. Cart Life may be one of the finest examples of gameplay creating meaning. In the IGF prize winner, tedium in mechanics are used to comment on the drudgery of 9-5 work, loneliness, desperation, and the alienation of labour. The problem here is that in creating meaning you usually sacrifice the most desired element of games—fun (think of Lucas Pope’s Paper Please, which I loved). It’s a tricky line to walk, but one with great promise as themes could be communicated with a novel energy that could revitalize boring or overlooked ideas.